2Wheel Chick: London Cycle Revolution? I Hope So! As I sit here watching a full evening's worth of cycling themed programmes on BBC4, having returned from a bicycle maintenance class in one of the London bike shops, and ridden on a "cycling superhighway" to get home, I realise that things could be picking up for cycling in London. Is cycling really growing in popularity and in the conscience of the everyday Londoner, or is it just something us cycling folks would like to believe? Some type of optical illusion? London now has a cycling specific cafe, Look Mum No Hands. 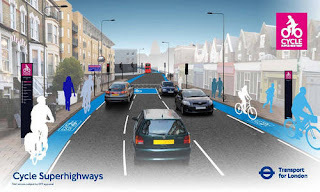 Good old Bojo, our Mayor has launched two cycling Superhighways that are meant to make cycling from the suburbs into central London safer for cyclists. We've even got a cycle hire scheme (like what you get in Paris or Barcelona), which will be launched this Friday. Apparently over 3,000 people have already registered to use the scheme. This all sounds very good, and a great advert to the rest of the world that London is making inroads to becoming a bicycle friendly city. I suppose the fact that people from all sections of society have been paying a little attention to the world's most famous bike race, the Tour de France, makes July an apt time to launch all things cycling related, and uptake is always going to be better during the summer months. I hope that the people marketing these schemes have properly thought the whole process through. The music will eventually stop and suddenly there won't be enough chairs (or bicycles) for everyone. The cycling superhighways will no longer be sporting the lovely luminous blue that makes the motorists give cyclists more room - there may be a few vehicles too many parked in the cycle lane - people out on a Barclays Hire Bike may get lost, have nowhere to redeposit their bike after use and get overcharged. Such are the potential hazards and teething problems when significant changes are made in cycling. I'm not against these changes at all. I am very pleased to see that Boris Johnson and Transport for London are doing their bit to improve cycling facilities in London. I just hope that they will follow their plans through thick and thin. No one ever said the road to success would be smooth. Cycling definitely seems to be getting a lot of press recently but when winter comes will it die and not get resurrected properly come next spring/summer? I hope not. 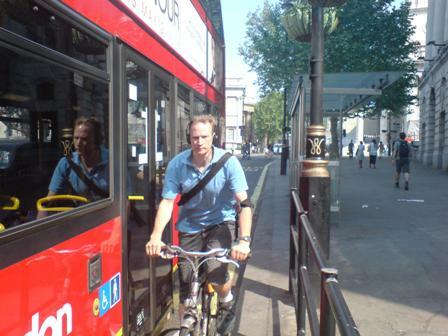 If that bus turns left the cyclist gets crushed into the railings.